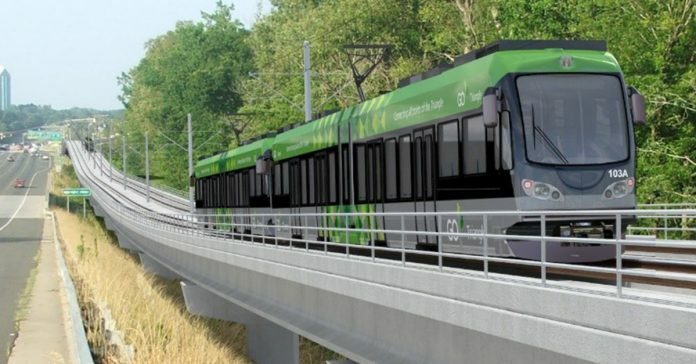 A Gannett Fleming/WSP joint venture has been appointed to act as the construction management consultant on the planned Durham and Orange counties’ light rail project. The 28 km light rail system will link UNC Hospitals in Chapel Hill and North Carolina Central University in Durham. The joint venture said it will provide constructability reviews, cost estimating, contract packaging, design, and specification reviews during phase one, and full construction management services during phase two. The Durham-Orange Light Rail Transit (D-O LRT) project includes 18 new stations and around 6 km of the route will run on an elevated alignment. Once open, the new line is expected to support 26,000 journeys a day and will connect the region’s top 10 employers. GoTriangle estimates that by 2057 the line could add $3.2 billion to property prices and generate $1.4 billion in tax revenue.